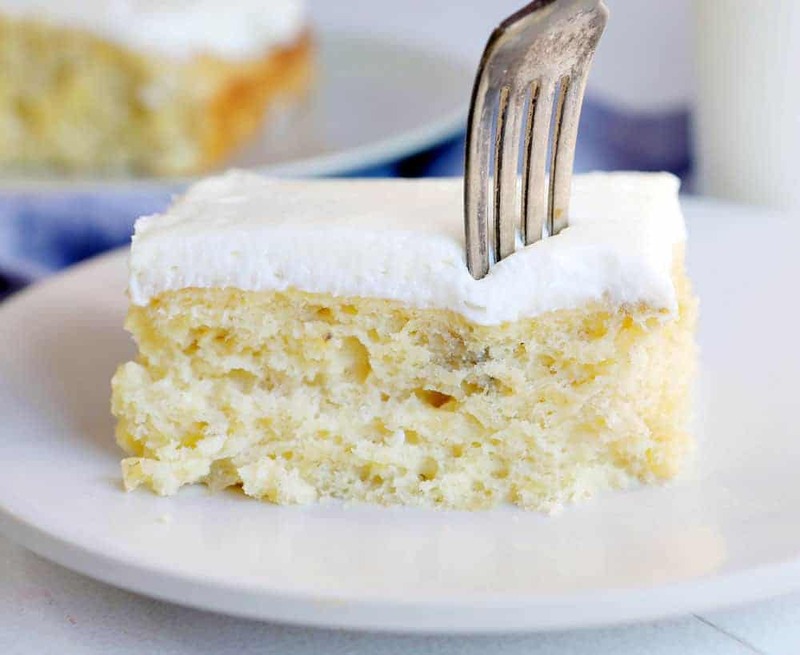 If you are looking for a Banana Cake with PURE banana flavor, this is the cake for you! 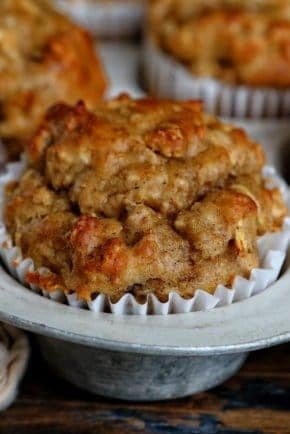 It is based on my favorite Banana Muffins recipe. I did leave out one ingredient that might be a game changer… scroll down to see more about that! So I am a brat when it comes to banana cake. I have another Banana Cake on my blog which is a giant 3 layer cake with fresh homemade banana curd. 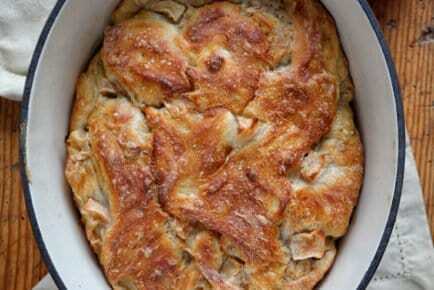 (It’s AHmazing BTW) These recipes have one big thing in common and that is NO CINNAMON. When it comes to banana cake I don’t want it to be banana bread. I want fresh, pure, perfect banana flavor. And this cake doesn’t disappoint! It is packed full of banana’s (3 cups!) and just enough sugar to sweeten them. It is dense yet light and has the most perfect crumb you will ever find. 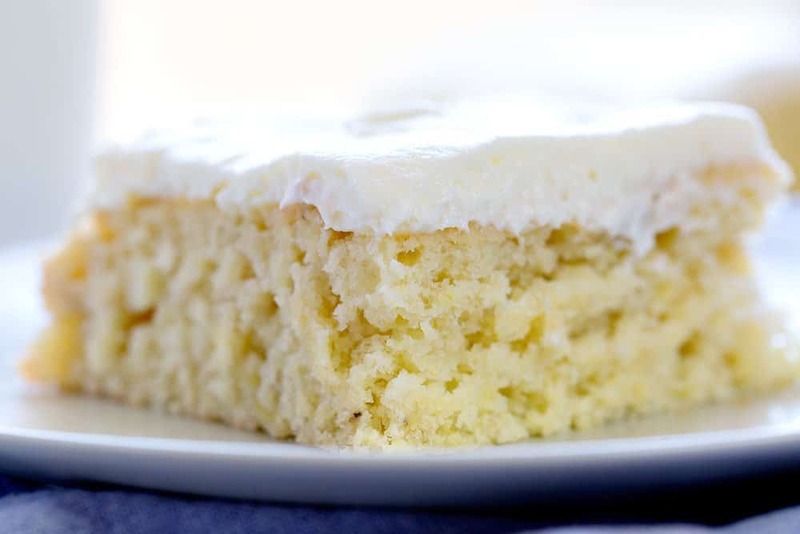 I often prefer this cake without any frosting at all, and when serving it naked you can also serve it for breakfast! 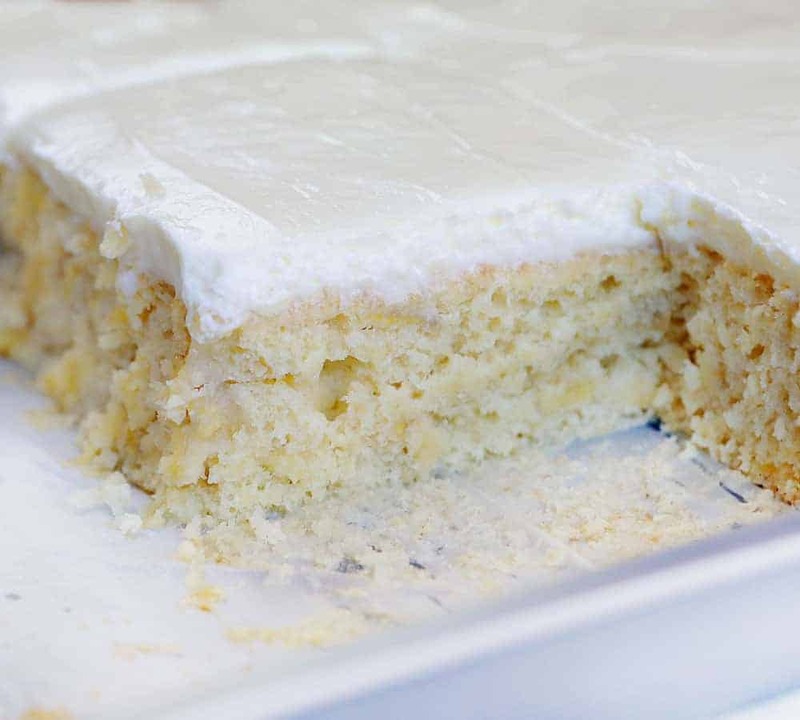 Because the star of this show is the banana sheet cake, I wanted to use a frosting that has a light and airy texture. 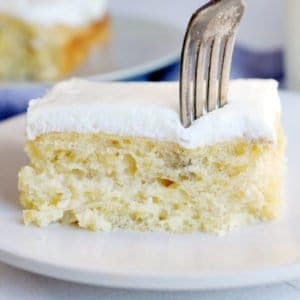 This Whipped Cream Cheese Frosting still provides all of that classic joy that comes from Banana Cake + Cream Cheese Frosting, but goes a step further and makes it velvety smooth! I use a stand mixer when making this recipe just to incorporate as much airiness as possible, but it can also we done with a hand-held mixer. Because the self-rising flour has baking powder already in it, switching out to all-purpose flour is very easy. Simply follow the recipe as listed but in place of self-rising, use the same amount of all-purpose flour and then add 2 teaspoons of baking powder. I mentioned above that you can eat this for breakfast because it is based on my banana muffin recipe. But OH MY WORD what that whipped cream cheese frosting does to this cake!!! It’s magical. Pure heaven. 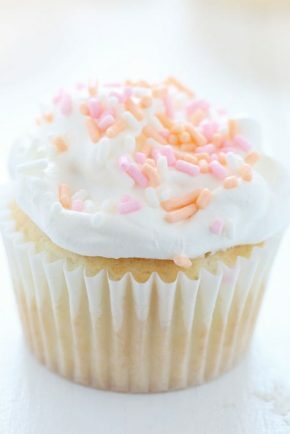 You will never want to make regular ole cream cheese frosting again! I shared the cake with many friends and family and got RAVE reviews from everyone who tried it. I have a feeling it will be your new favorite Banana Cake and the only Banana Cake Recipe you will ever need! 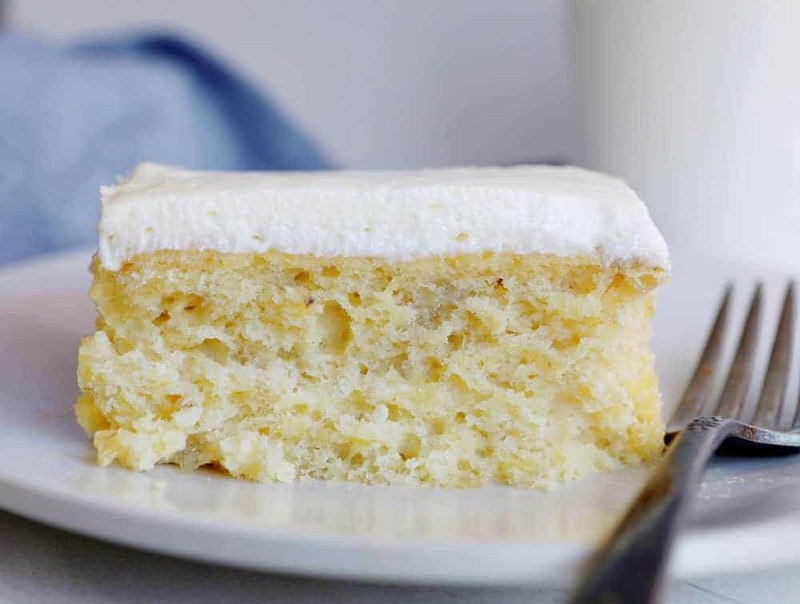 If you love banana, this is the cake for you! Preheat oven to 350°F. Prepare a 10x15 baking pan with butter and flour or non-stick spray. In a large bowl, mash banana's with a fork or with a hand-held mixer. Add butter, sugar, eggs, and vanilla and mix well. Add in the flour and stir until all ingredients are incorporated. Bake for 18-25 minutes. You want the top to be a light golden brown and an inserted toothpick to be removed mostly clean. The cake should have risen in the middle and spring back if you press gently with your finger. In the bowl of a stand mixer (or hand-held mixer), beat cold whipping cream on medium-high until stiff peaks form; about 2-3 minutes. Place whipped cream into a separate bowl and clean out stand mixer bowl. In clean stand mixer bowl (or using a hand-held mixer) whip cream cheese until light and smooth. Add in sugar, salt, and vanilla and beat until fully incorporated. Remove bowl from stand mixer and gently fold whipped cream into cream cheese mixture. Can be used immediately. You can store in the refrigerator until ready to use, just be sure to bring to room temperature before piping or spreading. Is it 9×13 or sheet pan? It can’t be both.you listed both of these. Which is better, very confusing. I’m sorry but I did not see the amount of flour to be used in this recipe. I’m at the point of adding flour how much flour do I add? I am very excited to make this. Hi maybe you can help me. I used to have a carrot cake recipe in all the moves I’ve made I lost. The recipe started out with a cup of raisins and a cup of boiling Water and you poured the boiling water over the raisins in a bowl let them soak then drained them it had one cup each of granulated sugar and brown sugar,4 eggs and I think 3or4 cups of grated carrots, it had cinnamon,nutmeg and allspice,I don’t remember how much flour or oil.it didn’t have any pineapple or applesauce in it.and it had a cooked cream cheese frosting attached to the recipe. Can you help me? I used almond flour to make it keto friendly for a guest. Not good. It tasted weird and had a very weird consistency. It smelled great, though, and will try again as written. I like it. Thank you for sharing all your recipe specially banana cake and chocolate cake.God bless. What can you replace egg for eggless recipe?? I usually use ground flax, one tablespoon of flax with three tablespoons water. Mix and let sit for 15 mins then add in. I used to love sara lee banana cake and bana frosting. Cant wait to try this one . Took waaaaaaay longer than 25 min in a 9×13 pan. I made the banana cake and the cake was very dense like a bread. 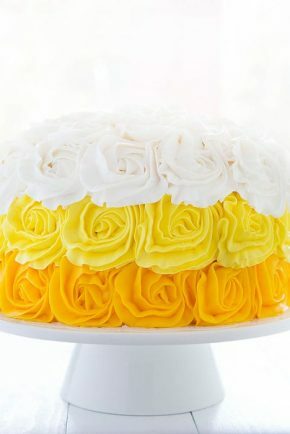 Is this the way the cake is suppose to dense, the picture looks like its airy like a cake. What could I have done wrong over mixed? It has to be missing ingredients in her recipe Mine was the same so I researched online and the others add baking powder and cup of milk this cake had no wet ingredient other than butter. Waste. Did you use the correct flour? If you use AP Flour the cake will not turn out. Self-rising flour is all-purpose flour with baking powder and salt added, therefore no need to add additional Baking Powder. Can I cover this cake in white chocolate only my granddaughter would like me to make her a banana birthday cake. I’m sorry but this cake was terrible. The frosting was good but the cake was very heavy and hard like and even though it had 8 bananas, it had a flour taste. I made this for my son’s birthday and I was embarrassed, everyone ate the frosting but left the cake. Awesome banana cake recipe.Simple and easy to make. I made this tonight for a bible study class. I was very disappointed that I went exactly by the recipe and it was way too salty. I didn’t add salt to the frosting because of all the salt in the cake batter. Beware, this is too, too salty! Sorry you did not like it. We have tested it and never found salt to be any sort of issue. I haven’t rated the recipe because I have not tried it yet. I have several ripe bananas in the freezer. I’ve used them to make muffins. 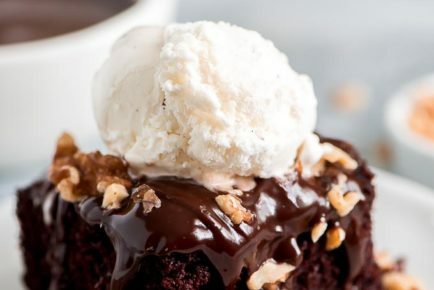 Am I correct in thinking that I can use frozen bananas in this recipe? You can but they should be thawed and excess fluid drained. I cut this recipie in half because I don’t have a 9×13 or sheet pan, but a 9×9 square pan. I still had exccess batter left. So I’m going to make muffins with the excess. 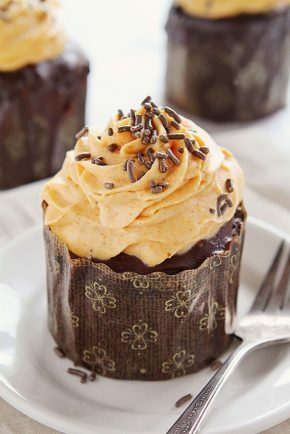 any baking time difference between cake and muffins?